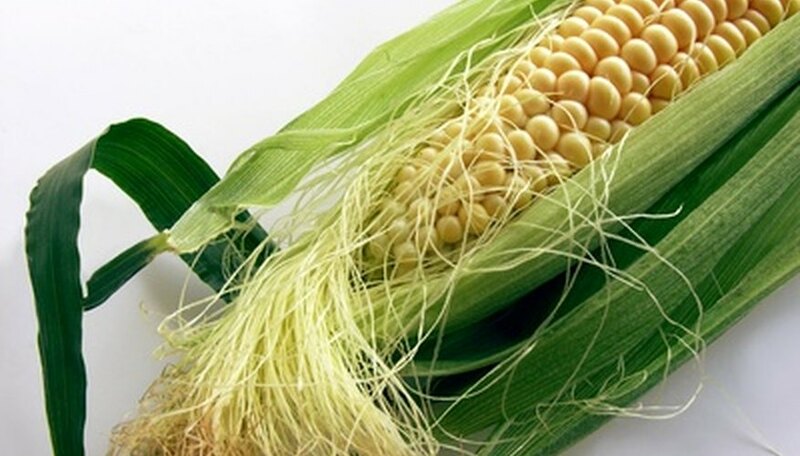 Golden Queen sweet corn is one of the most common varieties of summer sweet corn. It has a high sugar content, making it a favorite of corn lovers. The stalks of the Golden Queen can reach a height of 12 feet, and one ear of the corn can produce hundreds of seeds. To have a continuous crop of Golden Queen, year after year, save seeds from your crop to use as seed and replant the corn again next season. Plant a non-hybrid variety of Golden Queen sweet corn. At the end of the growing season, you will harvest seed off the sweet corn plants. Leave several ears of Golden Queen corn on the stalks when you harvest the rest of the corn for eating. The ears will remain on the stalk for another four to six weeks. Remove the ears from the Golden Queen corn stalk. Grasp them firmly and twist them to separate them from the plant. Pull back the husks away from the cob, and tie a string around the middle to hold them back. Hang the corn cob up to dry by fastening it to a nail in a dry area where it will not be bothered by pests. You can dry multiple cobs by tying all the husked ends together. Allow the cobs to dry for a eight weeks. A sign of dry sweet corn seed is that the kernels have wrinkled. Take the corn cobs down and remove the dried kernels by wrapping the palms of your hands around the cobs and twisting over a large paper bag so the kernels do not spill all over the floor. Separate the kernels from any debris and pour them into a clean glass jar. Seal the jar and store the seed in a cool, dry area. Plant your Golden Queen corn seed two weeks after the last frost for your growing area. Loosen the garden soil with a rototiller and mound the dirt up into rows that are three inches steep. Plant the corn seed one inch beneath the soil, with eight inches between each seed. You need to plant at least four rows of the corn if you use several ears as seed. Corn needs to be cross-pollinated, and the wind moving among four rows of corn will do that much easier than if there is one long row. Water the rows until the soil is moist but not soaking wet. Harvest the corn at the end of the growing season and then repeat steps 2 through 8 to plant Golden Queen corn the following year. Golden Queen sweet corn seeds can remain in storage for up to five years. If your seed kernels are not fully dry, it can cause mold to grow when they are in storage.